I am a professional meteorologist with an M.S. in atmospheric science, with over 15 years experience forecasting the weather for the National Weather Service. 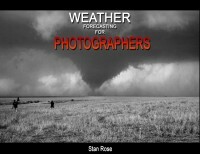 After resigning from the weather service in 2016, I have made use of my skills as a forecaster as my photography hobby has grown into a business. The success or failure of my landscape photography is often closely tied to my success in forecasting unique or dramatic weather conditions. For just a small sample of weather-related photos, see my Atmospheric Gallery by following the Gallery link at the top of this page. How to read and interpret weather maps and charts. How to identify, forecast, and photograph clouds. How to photograph great sunrises and sunsets.